Twenty-three corps will compete today during the Drum Corps International World Championship Open Class Quarterfinals in Michigan City, Ind. 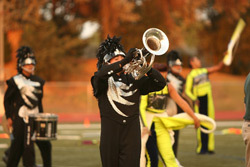 Check out this photo gallery to familiarize yourself with many of the Open Class corps that toured this season as part of the 2008 Drum Corps International Summer Tour. Photos by Francesca DeMello, Johnny Gilbert, Jolesch Photography, David Rhodenbaugh.